The endometrium is the lining of the uterus, which grows and sheds in cycles, governed by estrogen. One of its main purposes is to host a fertilized egg. At certain points of the cycle, endometrium grows thicker, preparing for the egg to implant in it. If the egg is not fertilized, the endometrium will shed in form of menstrual bleeding, after which a new layer will grow. Sometimes the endometrium grows or spreads in an abnormal way. For many women these changes and abnormalities cause no symptoms at all, but for others this can lead one of several possible conditions. Endometriosis is the most common of all symptomatic endometrial conditions. It is a chronic and often very painful condition that may also affect the fertility. This condition is characterized by endometrial tissue that grows outside its normal place, for example on the fallopian tubes, on ovaries or anywhere inside the pelvic cavity. This causes irregularities in the menstrual cycle, pain before and during periods, heavy bleeding and other symptoms. There is no definitive cure for endometriosis but this condition can be successfully managed. Medication treatment consists of hormonal therapy, for example through contraceptive pills, which suppresses the hormonal influence of the cycle on endometrial tissues. Pain killers are also widely used to manage the symptoms. Surgery, usually minimally invasive, can be required in cases where more conservative approach has failed to provide relief. This generally involves laparoscopic surgery. In particularly severe cases, the uterus and possibly the ovaries may have to be completely removed. Another condition associated with endometrium are uterine polyps, which are projections or connections on the lining of the uterine walls. They usually have a bulb-like base and stalk-like projections, possibly with branches. The polyps are estrogen-sensitive and pay pull or push on the uterus. They may also close the opening of the fallopian tubes or even the cervix. Some polyps may compromise fertility. 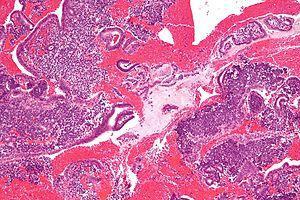 Uterine polyps cause irregular menstrual bleeding and increase the risk of uterine cancer. They can be removed through hysteroscopy. In case the diagnostic procedures show pre-cancerous or cancerous stages, the uterus may have to be removed. Adenomyosis is a condition in which abnormal growth of the endometrial tissue leads to endometrium invading the muscle wall of the uterus, resulting in discomfort, pain, feeling of pressure and swelling. These symptoms are particularly present before the menstrual period. Women over 30 who have been pregnant are more likely to suffer from this condition. Adenomyosis is often associated with endometriosis, cysts, fibroids and other gynecological conditions. The treatment for adenomyosis is similar to that for endometriosis. Surgical removal of the uterus seems like the only definitive solution but most women choose conservative care based on symptom management, since this condition will pass after the menopause is reached. Endometriosis II - What Causes Endometriosis ? ?